5 Bedroom Detached House For Sale in Sheffield for Guide Price £550,000. 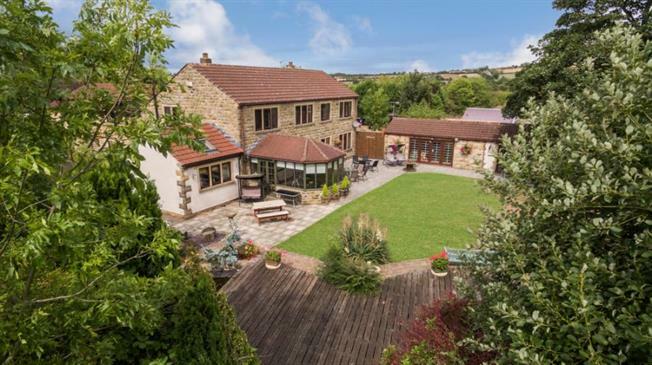 We are thrilled to bring to the market this bespoke effectively extended 5 Bedroom detached residence with far reaching views, occupying a larger than average plot with an integral Annex in Killamarsh the property is situated a stones throw from nearby Rother Valley Country Park. Only upon internal inspection can the ample flexible accommodation be fully appreciated. In brief the accommodation comprises; To the ground floor the Entrance door leads to the reception Hall, leading to the Office, Cloakroom/W.C, Snug, Living Room and further to the formal Dining Room with French doors to the Conservatory, Sitting room and fully fitted Kitchen which in turn provides access to the extremely generous Games room. To the first floor are Four generous Bedrooms and the family bathroom, a door gives access to the annex with generous living/Dining room and further double Bedroom with walk in wardrobe and En-suite Bathroom. The property occupies a larger than average plot and has a gated private driveway providing ample parking for multiple vehicles and leading to the integral Double Garage. Further generous gardens stretch to the rear and side of the property offering further potential for expansion subject to relevant planning consents. Far reaching views and patio areas make for superb 'Al Fresco' dining and only upon viewing can this truly be appreciated.